Below is a list of other services we offer at PrinsBank. Explore these options or you can talk to a banker at PrinsBank for more information or by visiting our Contact Us page. Easy access to your checking account when it is convenient for you. 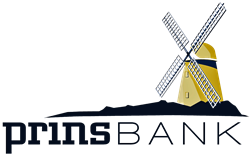 Contact PrinsBank for an application and to learn about this great card. Protect yourself from unnecessary charges. Intuitive way to pay bills and to receive and view bills electronically. Create a savings plan today with monthly automatic transactions!